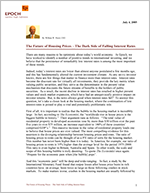 The Future of Housing Prices - The Dark Side of Falling Interest Rates - Epoch Investment Partners, Inc. There are many reasons to be optimistic about today’s world economy. At Epoch, we have worked to identify a number of positive trends in international investing, and we believe that the persistence of remarkably low interest rates is among the most important of these trends. Indeed, today’s interest rates are lower than almost anyone postulated a few months ago, and this has fundamentally altered the current investment climate. As any savvy investor knows, there are few things that matter in finance more than interest rates. Interest rates become the discount rate for virtually all investments, they provide the key metric when valuing public securities, and they serve as the denominator in the present value mechanism that discounts the future streams of benefits to the holders of public securities. As a result, the recent decline in interest rates has resulted in higher present values and stock market expansion, which have had an unequivocally positive impact on investor returns. But, is the news always good when interest rates fall? To answer this question, let’s take a closer look at the housing market, where the continuation of low interest rates is poised to play a vital and potentially problematic role. First of all, it is important to realize that the bubble in the housing market is incredibly large. In fact, according to The Economist, the “worldwide rise in house prices is the biggest bubble in history.” Their argument runs as follows: “The total value of residential property in developed economies rose by more than $30 trillion over the past five years to over $75 trillion, an increase equivalent to 100% of these countries’ comprised GDP’s.” This massive increase in the value of residential property leads one to believe that house prices are over valued. The most compelling evidence for this assertion is the diverging relationship between housing prices and rents. The ratio of housing prices to rents can be thought of as a P/E ratio of sorts for the housing market. This number has never been higher than it is today. In America, for example, our ratio of housing prices to rents is 35% higher than the average level for the period 1975-2000. This ratio is even higher in Britain, Australia and Spain. In other words, the scale and scope of this housing bubble is truly daunting. To quote The Economist once again: “Prepare for the economic pain when [the bubble] pops”. And this “economic pain” will be deep and wide-ranging. In fact, a study by the International Monetary Fund found that output losses after house price busts in rich countries have, on average, been twice as large as those following crashes in stock markets. To make matters worse, crashes in the housing market are usually followed by recession. The reason that housing market crashes are able to wreak such economic havoc is the dual problem of unemployment and wealth destruction. For example, forty percent of jobs created in America since 2001 have been in housing related sectors such as construction, real estate lending, and brokering. In California, this problem is particularly apparent, as there was a registered broker for every house sold in the state last year! Therefore, it is easy to see how a precipitous decline in already inflated house prices will have a massive effect on the employment status and wealth-generating potential of a huge portion of the labor pool. The full repercussions of the housing bust will be explored later in this paper. But, for now, the important question is: how did we get where we are today? How did the housing market bubble get so big? The first answer is one that we alluded to earlier in this paper – low interest rates. The surprisingly low interest rates of the past several years are certainly to thank for all the positive economic trends mentioned above. However, these low rates have also contributed to the housing bubble because they have provided an incentive for homeowners to borrow cash to purchase homes as investment vehicles. In fact, according to the National Association of Realtors, nearly one quarter of all houses purchased in 2004 were for investment purposes, not owner occupation. Another 11% were bought as second homes. Low interest rates, coupled with riskier forms of mortgage finance, allowed these buyers to borrow more and more in order to finance their investments in housing. In fact, the current housing finance environment is so attractive that over 40% of all first time buyers and 25% of all buyers made no down payment on their home mortgage last year. ARM’s (adjustable rate mortgages) have risen to 50% of all mortgages in those states with the biggest housing price increases. In today’s world, little or no documentation of borrower’s assets, employment, and income is required for a loan. And when getting a loan is this easy, and when interest rates are this attractive, the housing market bubble cannot help but grow dangerously out of proportion. But low interest rates are not the only contributor to the housing bubble. The popularity of housing investments has also sky-rocketed because property has become an attractive option for investors who have lost faith in equities. In addition, the economic principle of diversification has contributed to the housing bubble by way of securitization. Diversification softens the importance of any single loss to an individual’s portfolio as a whole, but leaves the portfolio exposed to the drivers of economic return for the entire asset class. Through securitizing heretofore illiquid assets – a single family mortgage, for example – specific risk is spread over a large pool of liquid assets, thereby reducing the lenders’ economic cost in the event of a mortgage default. While mitigating loss from specific risk, this trend toward mortgage securitization has resulted in a gradual increase in systemic risk, and has contributed to the housing bubble. At the heart of any bubble is systemic risk, not specific risk. For developed countries, capital markets are liquid and deep enough to handle almost any specific risk. It is only when an entire asset class is at risk that the system is placed in harm’s way. This is where housing is today – trapped in a bubble of unsustainably high prices and perilous systemic risk. This bubble will burst, and the aftershocks will be felt for a very long time. What are the economic consequences? First of all, since much of the recent GDP growth has been financed by “cash-out” mortgages, GDP will decline when housing equity withdrawals start to decelerate. Over the past several years, housing equity withdrawals have been massive, but have already begun to slow sharply. For example, in Britain and Australia, household spending has slowed considerably as a consequence. In Australia, retail sales growth has slowed from a rate of 8% to 1.8% over the past year, and GDP growth has fallen to half of its original level – from 4% to 1.9%. Much of this can be directly attributed to a decline in housing equity withdrawals, signaling that the bubble has already started to burst. For the U.S., this trend is particularly significant. Goldman Sachs estimates that total housing related equity withdrawals accounted for 7.4% of personal disposable income in 2004. Housing equity withdrawals are, therefore, a massive contributor to spending in the U.S. Independent of any other world issues (ex. China, Iraq, the fiscal and trade deficits, etc.) a decrease in housing equity would result in a dramatic slowing of economic growth and sharp declines in corporate profits. If we also consider the projected slowdown in China, which will result from the slowdown in the U.S. plus the anticipated decline in the marginal efficiency of capital deployed in China, the picture looks increasingly bleak. Even though America’s exposure to the collapse in housing prices seems unavoidable, there are those who cite the history of the American market and its resiliency to housing busts to downplay this concern for the housing market. After all, the U.S. was the only country to avoid a boom and bust during the 1970-2001 period studied by the International Monetary Fund. In this study, the IMF looked at 14 countries and identified 20 housing “busts.” A bust occurred when real prices, not nominal prices, fell. All but one of these 20 housing busts led to a recession, with GDP falling after three years to an average of 8% below its previous growth trend. In Japan, prices dropped for 14 years in a row, a 40% decrease from peak to trough. This historical data, plus the unprecedented range and scale of the current housing bubble, point to the conclusion that the U.S. is much more vulnerable to a “bust” than in decades past. This time, the conditions are riskier, the stakes are higher, and it is very unlikely that the U.S. can continue to escape from housing bubbles unscathed. All things considered, it is clear that the condition of the housing market, both domestically and overseas, requires a cautious, informed approach to investing. At Epoch, we believe that our balanced, insightful, and time-tested investment strategy can help to temper the negative impact of the bursting bubble. Specifically, we believe in companies that generate high-quality cash flows, whose stocks can be purchased at reasonable prices. In addition, we anticipate that yield will play an increasingly important role as a driver of equity returns. To us, yield is a combination of cash, share buybacks, and debt pay downs: all three of which are essential to enhanced shareholder value and equity prices. These investment strategies have been supported by the proven success and consistent out-performance of our funds, and are the enduring cornerstones of our portfolios.